With dual Ulpa filtration to filter both the working and cooling air. Each Ulpa filter is individually laser tested to ensure 99.999% efficiency on 0.12 micron. Dual Ulpa filter system ensures cleanroom compatibility and allows for maximum suction power. Made entirely of stainless steel for easy decontamination and excellent corrosion resistance. With autoclavable recovery tanks (stainless steel) and autoclavable floater system. Designed for applications where liquids and detergents are to be recovered in a controlled environment. Ideal for a variety of cleanroom environments, including: Pharmaceutical, Semiconductor, Microelectric, Medical, Bio-medical, etc. Optional middle ring system allows for a variety of activated carbon filters to be incorporated in the wet and dry cleanroom vacuums for the adsorption of vapors and odors. Ideal for mercury recovery and acid recovery. Static free and ESD safe. Tiger-Vac wet & dry cleanroom vacuums are designed to be grounded during use. With electrical resistivity less than 10 ohms, any static produced while vacuuming is quickly and effectively discharged to the ground. EMI / RFI shielded: will not disrupt computers and sensitive electronic equipment. When we first set out to build our cleanroom vacuum cleaners, we did not attempt to modify an existing model and adapt it for clean room use. We knew that the cleanroom industry deserved and wanted better, so we started from scratch. A quick glance at the EMI-CWR's innovative features will prove that we did not leave anything out. 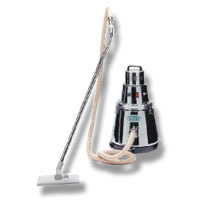 EMI cleanroom vacuum cleaners are certified for use in Class 10 cleanrooms. Cleanroom compatibility tests were performed by independent labs and copies of the test reports are available upon request. As part of our quality assurance program, every Ulpa filter is individually laser tested and every vacuum cleaner is individually leak tested before being shipped. This assures compatibility with Class 10 cleanroom conditions. The EMI-CWR is designed to be grounded during use. Any static electricity that is produced while vacuuming is dissipated through the conductive hose, through the vacuum cleaner and it is discharged to the ground. A ground continuity tester is included with every vacuum cleaner to verify ground continuity before use. The EMI cleanroom vacuum cleaners eliminate static electricity and static charge build-up and they protect sensitive electronic equipment. For critical static control applications requiring zero voltage potential (telecommunications facilities, computer and electronics manufacturing, integrated circuit manufacturing, etc.) a special TELECOM package is available. Conductive wheels are incorporated on the vacuum cleaner and a special tool kit is provided. Static dissipating micro tools and a round brush with conductive bristles are also available. The EMI-CWR is equipped with a dual-speed control that allows the operator to regulate the suction. The EMI-CWR also incorporates a thermo-protector which prevents the motor from overheating if there is a blockage in a nozzle or hose. The heavy duty construction ensures that the EMI-CWR will resist abuse and the industrial gaskets and seals ensure that the vacuum cleaner will always be "leak free". The EMI cleanroom vacuums are equipped with an electronic filter suppressor which reduces electromagnetic interference (EMI), both radiated and conducted, below the Class B limits for digital apparatus as established by the FCC and FCA. It also provides shielding against radio frequency interference (RFI). The electronic filter is wired in line with the motor. If the electronic filter should fail, power to the motor will automatically be cut-off. The outer shell of the EMI-CWR is made entirely of chrome polished steel which acts as a shield against interference from emitting sources. The EMI cleanroom vacuums will not disrupt computers, radio and video monitors and other sensitive electronic equipment.